Dr. Fabian is a Clinical Professor, Emeritus, University of Miami School of Medicine, Miami, FL. Images of the right and left sides of the body are not infrequently mistaken for one another during the interpretation of radiographs. The two sides of the body are essentially identical in appearance except that one is the mirror image of the other. When an image is made of a body part that can be viewed from either surface, such as a transparent radiograph, or a digitized image that can be electronically inverted, it is possible for laterality to be mistaken. As an example, the frontal view of the foot, whether on film or digitized, is normally taken with the sole of the foot against the cassette, resulting in an anteroposterior (AP) image. This view of the foot is both the easiest for the patient and the technologist and results in the best image and has consequently become the standard projection. The resulting image, however, can be viewed from either the front or the back. If viewed from the front or exposure side, the side from which the X-ray beam originally entered the body, it will appear to be a left foot. But if the same image is looked upon from the back-the opposite surface or nonexposure side, the viewer sees the mirror image, which appears to be a right foot. Therefore, whenever a radiograph is made, it is important for the technologist to identify which side of the body appears on the image. This is usually achieved by placing a lead marker on the front of the cassette, corresponding to the side examined. Alternatively, a label is attached directly to the film after it is developed, indicating which side is represented thereon. Since humans are occasionally fallible, however, this marking may be incorrect or omitted altogether. Hence, when the image is interpreted, there may be a question regarding which side of the body-right or left-actually appears on the image. This often occurs in busy radiology departments, especially in emergency departments (EDs). When an error is suspected in marking which side of the body has been examined there are two main possible outcomes. The first possibility is that the mistake creates such an obvious discrepancy that the error is promptly discovered and rectified. The following is a typical example of how this may occur. A patient injures the right hand but the busy ED physician erroneously writes "left" on the requisition. The alert technologist, after seeing the patient, realizes the physician's error and X-rays the right hand instead of the requested left hand. The technologist also properly identifies the image with a "RIGHT" marker, but then fails to make a note that a correction was made. When the film arrives to be interpreted, the obvious discrepancy between the requisition and the film marking must first be resolved and the usual question is "which side is actually on the radiograph?" This question arises every day and is usually dealt with by questioning the technologist. If it cannot be resolved onsite in this manner, the examination may be repeated, even if it means bringing the patient back from the ED or possibly even from home. In the first case, in which an obvious discrepancy is apparent, the question of laterality is usually resolved onsite and merely results in confusion, wasted time and effort, and perhaps unnecessary radiation. If the question cannot be resolved onsite and the patient is recalled for a repeat examination, there is a further loss of time and expense, and administration of unnecessary radiation, but, more importantly, at least the question is resolved. In the second and more serious circumstance, however, no discrepancy is apparent and the mistake goes undetected. This can result in medical mismanagement-either the absence of care where it is needed or inappropriate treatment to the wrong body part. Occasionally, the wrong side of the patient is casted, pinned, or, rarely, even amputated. The author has knowledge of one such case in which the error had a fatal outcome. The phrase "wrong site" surgery often actually refers to "wrong side" surgery. From time to time, such right/left mix-ups, among other major medical errors, attract the attention of the news media, and-as has recently been the case-have led to calls for efforts to adopt measures to avoid these errors. The advent of digitized radiography has not altered the basic situation. A radiodense marker is still applied to the outside of the cassette by the technologist to identify the side of the body displayed; and the marking can be erroneous. Either way, marking the side of the part examined is operator-dependent and, therefore, subject to human error. A different way to approach to this potentially serious problem is to positively identify the side of the image that received the entering X-ray beam. The major portion of a radiographic image is actually generated by the visible light fluorescing from the intensifying screens rather than from the radiation passing through the cassette. X-rays cause the screens to emanate light, and film is much more sensitive to this light than to the radiation itself. Therefore, simply blocking the light from the screen(s) with a marking (such as a decal) that is opaque to light but not to X-rays leaves the underlying portion of the film essentially unexposed. Radiologists have long realized that if they knew the side of the image that received the exposure they were usually able to differentiate right from left, and they used the position of the identification blocker on the radiograph to make this determination. However, at present, the location of the "blocker" may vary from one manufacturer to another, and this method has largely fallen into disuse. An approach exists that is automatic and not subject to the human error of mislabeling-positive identification of the side of the image that received the exposure. 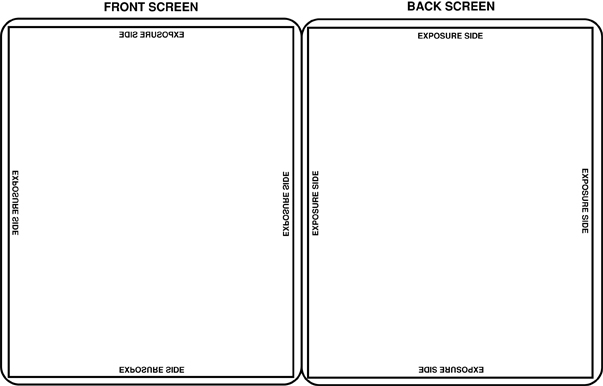 The words "EXPOSURE SIDE" are applied to the surface of the screen facing the cassette front-the side facing the X-ray tube. Since the film cassette contains two intensifying screens, optimal results are obtained when a second, mirror image of this marker is placed on the other screen, directly across from the first, so that when the cassette is closed the two markers align with one another and block light from both screens. This notation is placed on one or more locations along the margins of the screen, in letters just large enough to be readable (Figure 1). 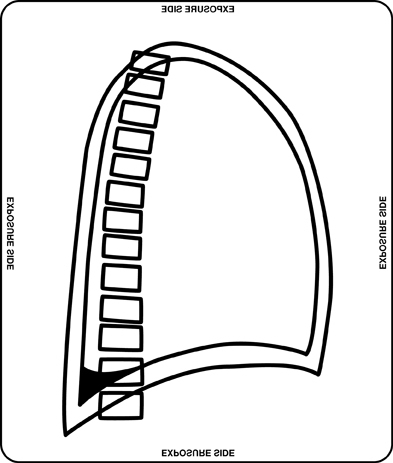 Strips of tape are placed on the front of the cassette corresponding to the positions of these internal markers to indicate that this cassette bears such markers and to alert the technologist not to cone off the marker or place important anatomic structures over the site (Figure 2). While this marking can be installed on existing casettes in the radiology department, ideally it would be furnished by the manufacturer with new cassettes. The exposure side of the image could then be identified as the side from which the words "EXPOSURE SIDE" read correctly or in a forward direction. 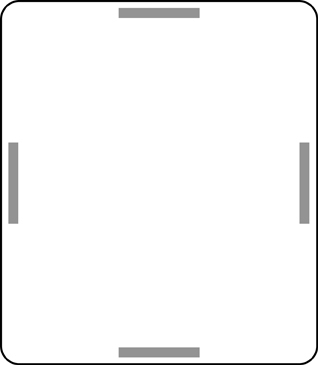 Even if the image is turned upside down or sideways during viewing, the words will always read in a forward direction (Figure 3). Only if the image is turned over to the other side and looked at from the back will the words appear backward (or as mirror images). 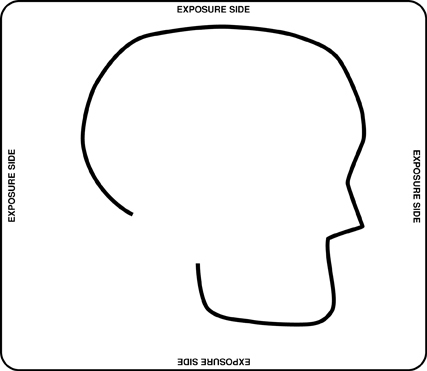 Simply knowing which is the exposure side of the film will generally allow the viewer to establish right from left in almost every case, presupposing the viewer has a basic understanding of how patients are positioned for radiographic exposures. While it is expected that this is common knowledge among radiologists, it will be summarized below. 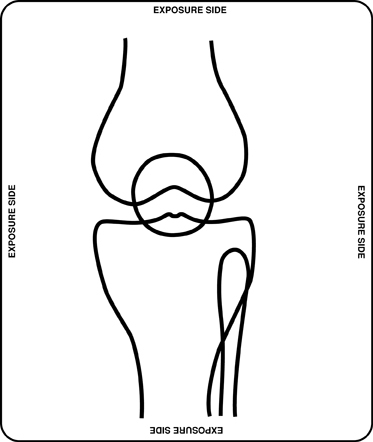 Frontal views of all the bones and joints of the lower extremity are generally exposed in the AP projection (front to back) (Figures 4, 5, and 6). Lateral views are normally exposed mediolaterally (ML), with the X-ray beam directed at the inner aspect of these parts and exiting laterally (Figure 7). Frontal views of the hand and wrist are exceptions in that they are normally exposed in the prone position, posteroanteriorly (PA), while frontal views of the remaining structures of the arm are exposed anteroposteriorly or (AP). 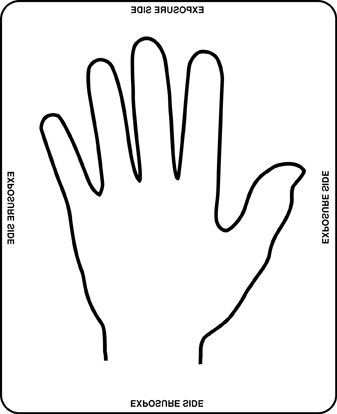 Frontal views of the hand and wrist are normally taken in pronation, palm down, as this position is easiest for the patient and technologist and generally results in the best images (Figure 8). Views of the forearm, however, are taken supine (AP), since the radius and ulna would overlie one another on a prone view. All other frontal views of the upper extremity are normally exposed in the AP projection, front to back, as is the lower extremity. Frontal views of the shoulder are likewise exposed AP, and if the image includes part of the thorax, lateralization becomes even easier. Lateral views of the upper extremity are generally taken in the radioulnar direction, with the thumb directed upward. Remembering that the anatomic position of the upper extremity has the palm of the hand facing forward, lateral views are actually taken in the lateromedial direction, opposite of the lower extremity. Therefore, on lateral views of the arm, just as of the leg, one can determine from the direction that the ventral and dorsal aspects of the body part examined face whether it is a right or left extremity. The pelvis is usually radiographed AP, from the patient's front, with the patient lying flat on the X-ray table. Flat and upright views of the abdomen are usually taken in the AP projection as well, with the patient's back flat against the table. Almost all frontal views of the lumbar spine are taken in the same projection as the abdomen-AP, with the patient's back against the table. However, as noted below, as an exception to the standard projection, occasionally some physicians will request that frontal views of the lumbar spine be exposed PA, to better visualize the lumbar interspaces. Frontal views of the cervical spine are generally taken in the AP projection, front to back, as are the obliques. Lateral views can be identified as to whether they are right or left lateral by the direction in which the elements of the spine are oriented. Frontal views of the skull may be exposed in either the AP or PA projections. One can generally determine which view was taken by whether the facial structures are magnified or not, these structures being less magnified on a PA view. Lateral views can be identified as to whether they are right or left lateral by the direction in which the facial structures are oriented (Figure 9). Because the heart lies asymmetrically to the left in the thorax, determining right from left in the thorax is not a problem except in the rare case of situs inversus. Conversely, when viewing a chest radiograph, knowing which side of the body is the right side and also knowing which surface is the exposure side tells the reader whether it is an AP or PA view. This fact can have diagnostic significance at times. For example, knowing it is a PA view virtually assures that it was also taken in the upright position and any pleural fluid present will tend to gravitate inferiorly (Figure 10). The film mammogram is a special case. While, in practice, it is rather rare for the side to be mismarked, at times it is still helpful for the viewer to be able to verify which is right and left. The breasts, as other paired body parts, are mirror images of one another. Therefore, by viewing the film from the exposure side, with the apex of the breast oriented away from the reader, it is usually possible to tell from the contour of the breast and the distribution of ductal tissue which is the right breast and which is the left. With mamography, one generally does not need a marking to identify the exposure side of the film, since the two surfaces differ from one another. The emulsion is on only one side, the exposure side, and this gives it a dull, matte finish. The opposite, nonexposure side is smooth and shiny. The essence of this simple system is based on the fact that the vast majority of radiographic examinations are exposed in standard projections. There are standard positions for all body parts, generally established because they are the easiest positions for both the technologist and the patient and also because they tend to display the anatomy to optimal advantage. A prime example of this, as noted above, is the AP view of the foot. The frontal view of the foot is exposed with the sole downward, against the X-ray cassette. 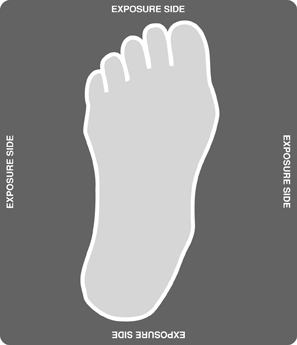 For the practical reasons stated above, this projection is used whenever a frontal view of the foot is requested; so if the viewer looks at the image from the exposure side, it will be almost intuitively obvious whether it is a right or left foot. However, for various reasons, images are occasionally taken in nonstandard projections (see examples below); in such cases, this system cannot be relied upon to give proper lateralization. The radiologist should be aware of this possibility and be alert to the various circumstances in which this may occur. When the radiographic examination is made at the bedside, the technologist may vary from the standard technique, usually for practical reasons (eg, to minimize inconvenience to the patient, or to decrease the need to move the equipment around the room). 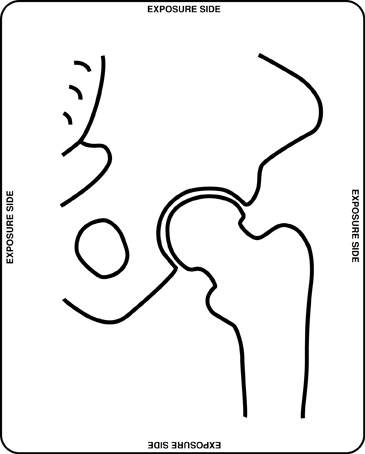 Typically, for example, when portable views of the knees are taken, both lateral views may be exposed with the X-ray tube on the same side of the bed, using a horizontal beam and elevating the knee to be examined. 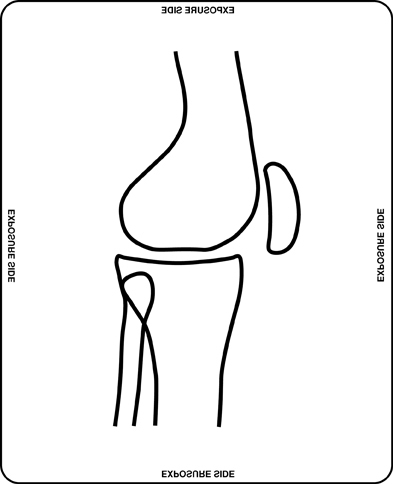 One lateral knee view then will be exposed in the usual mediolateral projection, while the other lateral may be taken lateromedially. The corresponding frontal views of both knees will still be exposed AP. Particular views of interest may be requested to view one area to advantage. Such views may be customized to the area in question and often may not be standard. One such nonstandard view is the frontal view of the lumbar spine, requested by some physicians to be done in the PA projection rather than in the conventional AP view. This is requested because the normal lordotic curvature of the lumbar spine allows the intervertebral interspaces to be shown more optimally in this projection. In spite of such exceptions, however, the vast majority of radiographs are exposed in the standard projections summarized above. When nonstandard projections are used, there is usually a reason that is known to the radiologist. When the viewer knows the side of the image from which the exposure was made-the side from which the words "EXPOSURE SIDE" read correctly in a forward direction-and looks at the image from that side, he or she can generally tell which side of the body is shown on the image. 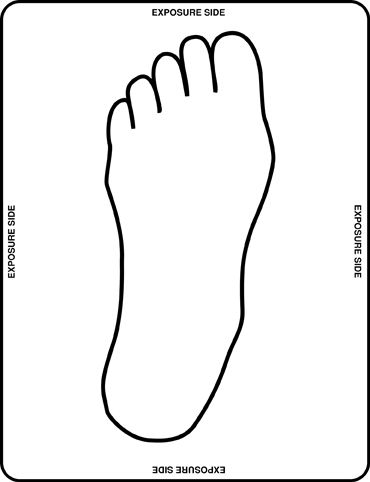 Using the frontal view of the foot, for example, one should look at the image from the exposure side and then orient the foot so that the toes are pointed away, as one looks down at one's own foot; if the great toe is to the right, it is a left foot image. This same simple principle applies to any body part examined. The traditional methods of radiographic marking (eg, using a lead marker on the cassette exterior or affixing a side label to the film after it is developed) will, of course, still be used. The additional information obtained by marking the exposure side of the image, however, can serve as a valuable backup or crosscheck to the conventional, operator-dependent method. When the information provided by the two systems is in conflict, this discrepancy should alert the viewer to a possible error in film marking. Knowing the exposure side should help to resolve questions of laterality on-site, usually without the need to repeat the examination and, ultimately, it is hoped, will prevent erroneous interpretation. Knowing right from left on X-rays: A way to minimize errors of laterality. Appl Radiol.